Safe drinking water is a critical priority as you prepare for emergencies. You can only survive 3 days without water. A 55-gallon barrel is a great way to store a large amount of water in a little space. 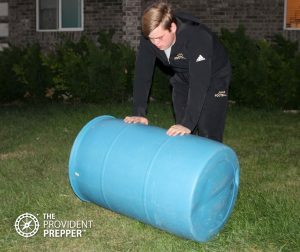 How do I store water in a 55-gallon plastic barrel for emergency long term storage? One 55-gallon barrel will supply 2 people with 2 gallons of water per day for a little more than 2 weeks. That’s a lot of water in a small space. Today we are going to take the mystery out of storing water in 55-gallon barrels for long term storage. A 55-gallon water barrel is a great way to store water long term for emergencies. But not just any barrel is a safe candidate to hold your precious water. The barrel must be made out of a food grade plastic. High-density polyethylene (HDPE) is the plastic commonly used to make the popular blue 55-gallon water storage drums. A standard 55-gallon water barrel measures 36” high x 24” wide. The barrel weighs roughly 22 pounds and 55 gallons of water weighs 460 pounds for a grand total of 482 pounds. New food grade water barrels are best but come with a significantly higher price tag. It is more important to get your water stored water today than it is to wait until you can store it perfectly. Remember that “good enough” is “perfect”. 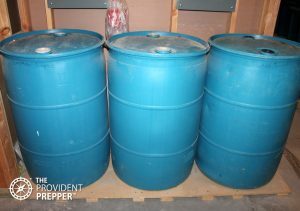 It is possible to obtain used food grade water barrels for a fraction of the cost. 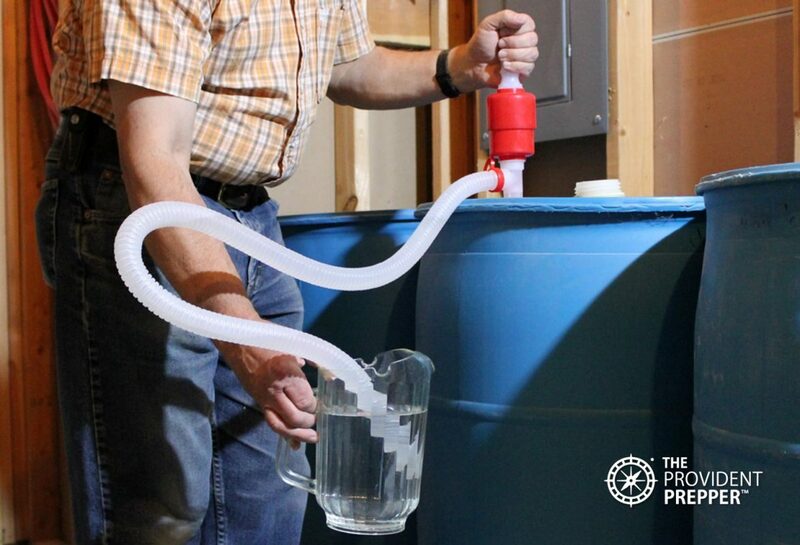 Never re-purpose a barrel for water storage that has held anything that you would not consume. Clean all barrels well before filling for long term storage. Our budget restraints require that we get a little creative in our prepping. We store some of our water in re-purposed soda syrup barrels. The water in those barrels still has a faint odor of lemon-lime syrup from its original contents. It seems to fade a little bit more every time we rotate the water. We plan to use the water from the re-purposed barrels for hygiene or we will filter it before drinking. However, if we had to drink it as it is, there is nothing in that water which can harm us. Start with a clean food grade plastic barrel. 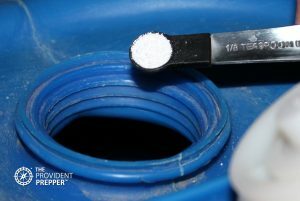 If the barrel has been used, I recommend adding a couple of gallons of a strong chlorine solution to each barrel and rolling it around for a while to ensure that every part of the interior of the barrel comes into contact with the solution. I make the solution by mixing one teaspoon of calcium hypochlorite or one cup of fresh chlorine bleach to two gallons of water. Allow the chlorine to make contact for at least 60 minutes. We usually roll the barrel around for a few minutes several different times during the day and then fill it for storage the following day to ensure adequate disinfection has occurred. Drain the chlorine solution from the barrel and rinse well with clean water. 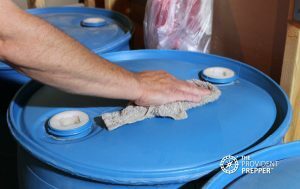 If the barrel contained a sticky or oily substance, we add a little bit of dish soap during the initial cleaning process. Dish soap will leave a residue so we only do this when the situation requires it. Be sure to continue to rinse the barrel until you are comfortable with the cleanliness of the barrel. Once the barrel is thoroughly cleaned and located in its permanent home, fill it with the cleanest water available. I prefer to use a clean RV drinking water hose to when filling a water barrel to ensure that the water is not contaminated during the filling process by a garden hose. We store our hose with the ends screwed together to prevent contamination. However, a garden hose will get the job done if that is what you have. 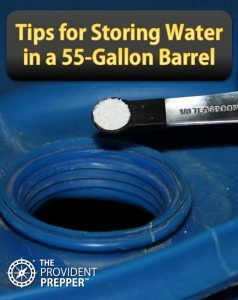 These are the best methods to treat water for long term storage in a 55-gallon barrel. They will kill any bacteria or viruses that may be in the water. Add 1/8 teaspoon of calcium hypochlorite to the filled barrel and screw the lid on. I prefer calcium hypochlorite over bleach. Add 2 Tablespoons of FRESH unscented regular bleach (sodium hypochlorite). Liquid bleach must be fresh to be effective and there are other chemicals in bleach that are needlessly added. Add 1 bottle of Water Preserver Concentrate. It is an expensive formulation of sodium hypochlorite that is stabilized and pH balanced. Add Aquamira chlorine dioxide 2 part water treatment bottles. This is also a more expensive option that uses oxygen to disinfect the water and actually improves the taste. Use the method that you feel most comfortable with. I prefer to use calcium hypochlorite because it is inexpensive and simple. Treatment to disinfect the water may not necessary if your water supply comes from a chlorinated municipal source and you feel confident that both your container and the water are clean. You may also choose not to treat your water at the time of storage and opt to treat it before use instead. It is possible that adding chlorine to the water may accelerate the leeching of the plastic into the water. If there are organics, there may be a concern about disinfection byproducts in the water. I choose to treat the water at the time of storage because I don’t know what the situation will be when I will need to use it. What if I am unable to disinfect the water and need to drink it straight from the barrel? I prefer to treat the water stored in our barrels up front to ensure that the water is ready to drink. I am prepared to run the water through a good quality filter when possible before drinking. 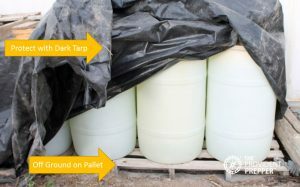 Ideal storage location for water barrels is a cool, dark location. A basement storeroom is the perfect environment but presents some serious challenges when it comes to rotating the water. Remember it is more important to store water than to store it perfectly. 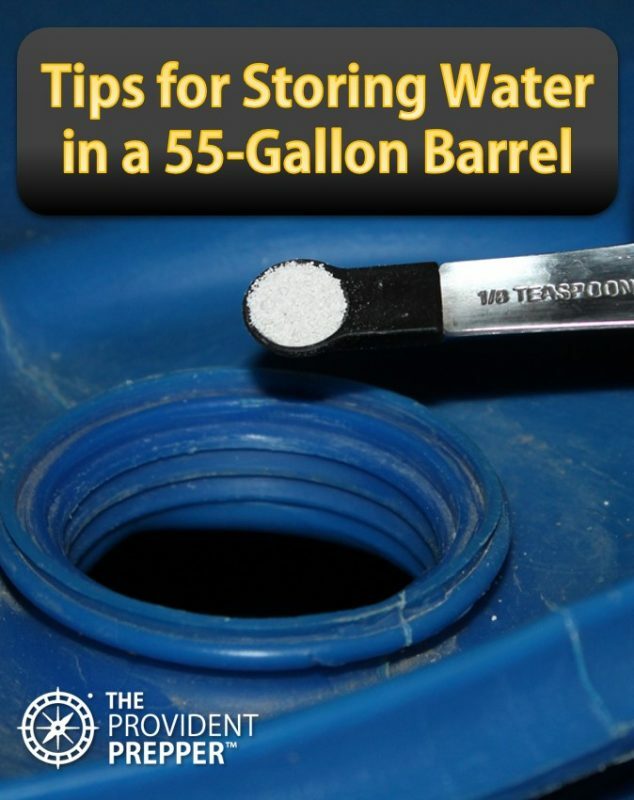 These are some best practices for storing water barrels. Locate your water barrel out of direct sunlight. Strive to store water barrels where the temperature is cool and stable. Store your barrel off of the concrete. Store away from chemicals and gasoline. Plastic is permeable and may leach chemicals into the water from nearby containers. Water barrels stored outside should have plenty of head space to allow for expansion and contraction with temperature changes. Sunlight will break down the plastic and can promote algae growth. A heavy dark tarp will help protect the barrels from light. Store water barrels off the ground on sturdy pallets or wooden planks. Rotating water in a 55-gallon barrel can be challenging. That 482 pounds are quite the beast to be reckoned with. Jonathan, my brilliant engineer, devised a simple way to rotate our water barrels without moving them from their basement home. He installed some hose connections to the main water manifold which is located near the barrels. A floor drain is only a few feet away. That means that the water from the barrel can be easily siphoned out of the barrel into the floor drain. The barrel is filled with fresh water from an RV hose connected to the water manifold. It is a brilliant system. Kristofer Johnson invented a cool rack for simple rotation of water in 55-gallon barrels. Titan Ready makes a hydrant water storage system that stores two 55-gallon water barrels on a rack on their sides for easy use and refilling. You might want to check it out. Do I Really Need to Rotate My Water Storage? It is best to rotate your water on a regular basis. The official recommendation for water storage rotation is every 6 months to a year. In my world, that is just not going to happen. Water is a stable compound of H20 and does not “go bad.” If you put clean water in a clean container, you may have some plastic that leeches into the water, but the water will be safe to drink. Since you have used a food grade barrel, the plastic is not a cause for concern. You eat and drink foods that have been stored in plastic every day. This water is for emergency use. If you have any concerns about your stored water, filter it before drinking. Make it a practice to check water storage containers periodically. If the water has changed in appearance or smell, rotate it. 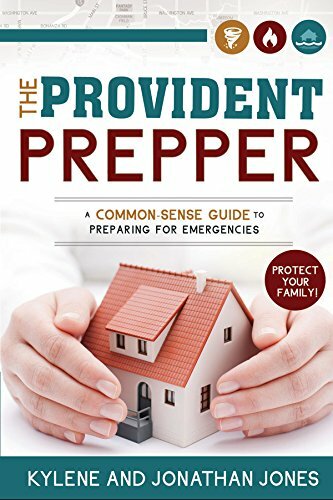 Remember that the water you store will always be safer than water you can find during a disaster. The first step to access water from a 55-gallon barrel is to wipe the dust off of the top of the barrel. Starting with a clean surface will prevent contaminating the water when the barrel is opened. Once the top of the barrel is clean, open one of the bungs (plugs) on the top of the barrel. The barrels usually have two bungs which can be difficult to open. A bung wrench or channel lock pliers may be required to open the plugs. Insert a clean siphon or hand pump into the water barrel. 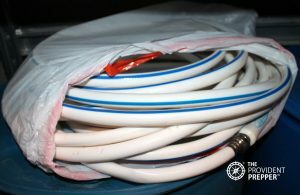 Our pump is stored wrapped in plastic to keep it clean and prevent it from becoming contaminated. If you do not have a pump, the water may be siphoned out using a tube or hose. Pump water into a pitcher or a smaller water storage container. Carefully examine the water. It should look and smell like clean drinking water. Filter the water before drinking if you have any concerns about the safety of the water. On a little side note, the hand pump we purchased does not actually fit our water barrels correctly. The pump is smaller than the opening on the barrel. It pumps the water just fine, but we are unable to leave the pump in the barrel. It should not be necessary to filter the water before drinking. However, filtering can only improve the taste and safety of the water. I will be drinking the water straight from the barrel, but I drink tap water. Jonathan, however, will always run his water through a quality filter before consuming. It is a personal preference. Get That Water Barrel Filled! Storing water in your home will give you the best chance of having clean, life-saving water to drink when disaster strikes. We have so many people confess to us that they have the water barrels, but they are empty. They haven’t gotten around to filling the barrels yet because they are not quite sure how to go about it. No excuses! Now you know exactly how to fill and treat a barrel of water for long term storage. 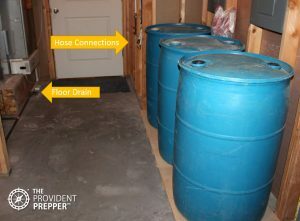 Empty water barrels are useless in a disaster. No more excuses! Fill your water barrels today!